The student must at least have finished the Basic or Fast track training courses. 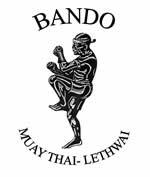 Thailand’s Thai Boxing & Burma’s bare knuckled head butting throwing styles combined in the Kevin Junior syllabus of “BANDO”. A style of bare knuckle kickboxing incorporating throws and head butts. This is different to Thai boxing techniques since western boxing techniques are employed here. This style of boxing is commonly called “Lethwai” in Burma. Seibukan karate do – Sabaki Jissen Style – continuous contact with deflections defeating an opponent before another attack can be launched. Excellent base for budo realists. Seibukan utilise sabaki rather than kata in its applications and is the most advanced system in its concept. Reality based military style of combat armed & unarmed, single & multiple attacks. Used by law enforcement around the globe as the most effective form of safety to personnel in all situations.